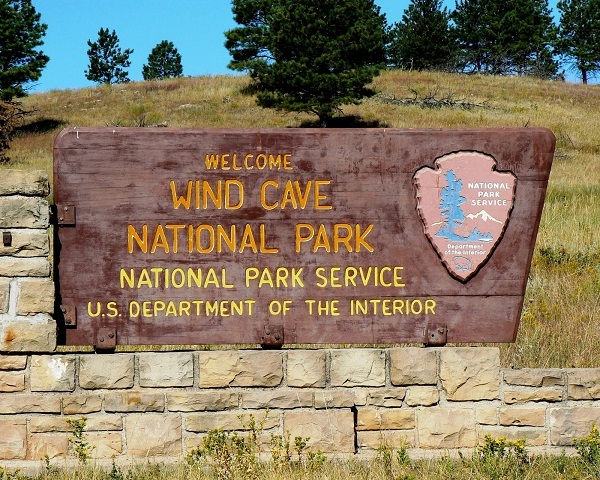 Welcome to the Wind Cave National Park Information Page. Wind Cave National Park is located in southwestern South Dakota. The Park is south of Rapid City and west of Bad Lands National Park and seven miles north of Hot Springs, South Dakota on Highway 385. The closest major airport is Rapid City, South Dakota. 1. Take Highway 385 South to the park. 2. Take Highway 385 South to Highway 16 East to Stateroad 87 South to the park. 1. Take I-90 West to Highway 16 South to Stateroad 87 South to the park. 2. Take I-90 West to Highway 16 South to Highway 385 South to the park. 1. Take Highway 385 North to the park. 1. Take I-90 East to Highway 385 South to the park. 2. Take I-90 East to Highway 16 East to Highway 385 South or Stateroad 87 South to the park. Visitors traveling on I-90: At Rapid City, South Dakota, exit onto Stateroad 79 South. Follow Stateroad 79 South approximately 50 miles to Highway 18. Turn right onto Highway 385 North, which will take you through Hot Springs and into Wind Cave National Park. Follow signs to the visitor center for cave tours and general park information. Visitors can also reach the park by following Highway 16 West out of Rapid City onto Highway 385 South. Visitors traveling from Nebraska can follow Highway 385 North to the park. On 03 Jan 1903, President Theodore Roosevelt signed the bill creating Wind Cave National Park. It was the seventh national park and the first one created to protect a cave. The parklands at that time were small and there were no bison, elk, or pronghorn. They came later as the park boundaries expanded. During the 1950’s and 60’s, park wildlife was the focus of much attention. Because of the lack of large predators, like wolves and grizzly bears, the bison and elk herds had grown to the point that they were literally “eating themselves out of house and home.” Park rangers began to evaluate the carrying capacity of the park. Carrying capacity is the number of animals that can exist in a habitat without damaging it. To solve the problem of overgrazing, the bison and elk herd sizes were reduced. Park rangers began an active program to manage the herd size. They began rounding up the animals and shipping the excess live from the park to other parks and reserves. Rangers also worked to improve the grassland by reseeding overgrazed areas with native grasses and controlling exotic plant species. The visitor center, including two exhibit rooms and restrooms, is accessible. Campground restrooms and one campsite are accessible. Limited areas of the cave are accessible to wheelchairs. The visitor center and the cave are accessible to people with limited mobility. Please call ahead to make special arrangements are at the information desk for a special tour. Limited areas of the cave are accessible to wheelchairs. There are fees charged for these services. Please call the park at 605-745-4600 for more information. A special needs cave tour is available, by request, for visitors with physical limitations who cannot participate in the regular tours. Please call ahead to make special arrangements or inquire at the visitor center information desk for this special tour. Stay at least a day to leisurely view exhibits in the visitor center, tour the cave (length of tours vary), and spend time viewing wildlife, hiking, driving park roads, and participate in the park’s Junior Ranger program. Wind Cave National Park is one of the world’s longest and most complex caves and 28,295 acres of mixed-grass prairie, ponderosa pine forest, and associated wildlife are the main features of the park. The cave is well known for its outstanding display of boxwork, an unusual cave formation composed of thin calcite fins resembling honeycombs. The park’s mixed grass prairie is one of the few remaining and is home to native wildlife such as bison, elk, pronghorn, mule deer, coyotes, and prairie dogs. The backcountry of Wind Cave National Park offers visitors a great opportunity to experience and enjoy the abundant resources of the park. Backcountry camping is limited to the northwest area of the park. This area, north of Beaver Creek, east of Hwy. 87, south of NPS 5 and west of Highland Creek Trail, is shaded in gray on the map. Within this area are several different habitats, prairie, forest, and riparian, with a variety of plants and animals living there. There are maintained and marked trails within that section and throughout the park, however, the entire park is open to hiking. Elk Mountain Campground, with 75 campsites, is located one mile from the visitor center. Other camping is available throughout the area in federal, state and private campgrounds. All cave tours are ranger-guided and leave from the visitor center. Tickets are sold on a first-come, first-served basis. Long waits for tours may be encountered during peak summer visitation. To avoid waits, the best time to visit the cave is during the early hours of the day. During the summer, weekends are good times to visit; Tuesday and Wednesday are the busiest days. Reservations are recommended for the candlelight and caving tours. Reservations for organized groups are available. For more information please call: 605-745-4600. The same number is used for TTY. Fees are charged for cave tours and camping. Cave tour fees range from $4.00 to $15.00 per adult depending on the type of tour. Youth, ages 6 to 16, receive a reduced price for cave tours. Ages five and under are free although some tours do not allow children. The camping fee at Elk Mountain Campground is $10.00 per night per campsite from mid-May to mid-September. From 01 Apr to mid-May and from mid-September to 31 Oct, campground facilities are reduced and the fee is $5.00 per night. Persons with Golden Age or Golden Access Passports receive a discount on cave tours and camping fees. This discount applies only to the card holder for cave tour fees. A vending area offers limited snacks and beverages from 01 May through October. Restaurants and grocery stores are located in nearby Hot Springs and Custer, South Dakota. Custer State Park offers restaurants and mini-markets for camper supplies in season. There are 30 miles of hiking trails in the park. Highway 385, Stateroad 87 and two backcountry roads make much of the park accessible to motor vehicles. Lodging is not available in the park. Help preserve the environment at Wind Cave National Park by keeping all dogs, cats and other pets on a leash at all times. Pets running loose disrupt the native wildlife, can disturb other park visitors and are sometimes the targets of larger wild animals. Pets are not permitted in the caves. Regularly scheduled cave tours, year-round. Five types of cave tours are scheduled approximately every twenty minutes, from 8:40 am to 6:30 pm, daily. Tour schedules are reduced the remainder of the year. Guided prairie hikes, evening campfire programs, and visitor center lawn programs, in season. A Junior Ranger program is available for ages 12 and under. The Visitor Center contains two exhibit rooms featuring cave exploration, cave formations, early cave history, the Civilian Conservation Corps, park wildlife, and Native American history in the Black Hills. Spring and fall weather are the most variable with cool, damp days alternating with dry, warm ones. Summers are generally sunny, hot, and dry. Winters are generally mild with little snow, but occasional sub-zero temperatures can be expected. Dress appropriately for the season. Persons touring the cave should wear low-heeled walking shoes with nonskid soles and a lightweight jacket or sweater. The cave is 53 F (11 C).